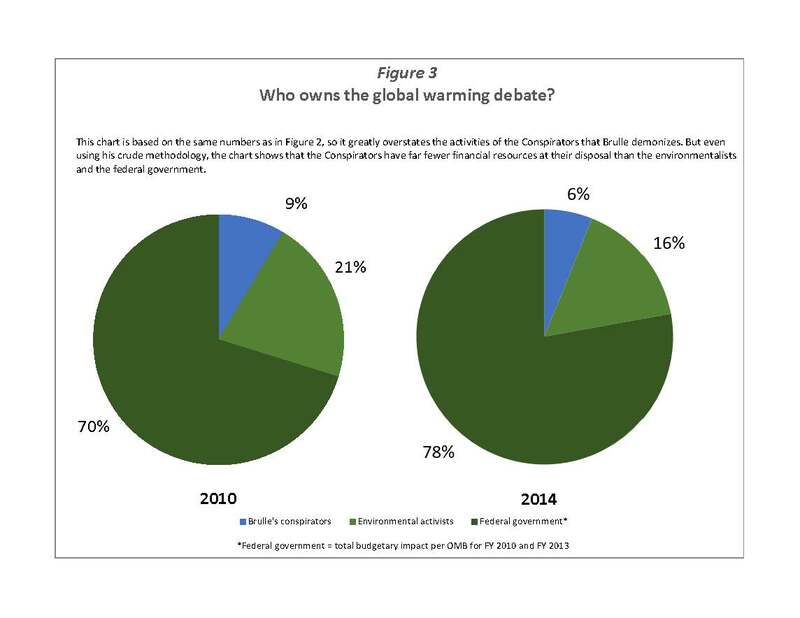 Counting Climate Dollars: Who Controls the Climate Debate? Robert Brulle, a sociologist at Drexel University, thinks he has uncovered a vast conspiracy of energy companies and their conspirators, whom he alleges work to “deny climate change” and make billions of dollars while destroying the planet. In a still widely cited study Brulle claimed to expose a vast network of organizations executing “a deliberate and organized effort to misdirect debate and distort the understanding of climate change.” Brulle’s premise centered on the uncertainty many Americans feel over the alarmist claim that severe climate change is occurring because of man-made carbon dioxide emissions. Brulle inferred that this uncertainty stems from a conspiracy that prevents the public from sharing his alarmist climate views. Worse, the public’s uncertainty prevents Brulle and his environmentalist allies from convincing lawmakers to restrict carbon dioxide emissions and save the planet. That claim was false twice over. First, Brulle’s study did not measure spending but income—regardless of whether that income was spent on anything. Second, the study made no effort to isolate the amount these 91 Conspirators spent to engage climate science issues, even though most of the diverse groups regularly engaged other policy debates (welfare, telecom regulation, agricultural policy, tax rates, ad infinitum). Brulle’s wide net also snared groups that conduct little research or advocacy, like the Intermountain Rural Electric Association. IREA is a nonprofit co-op that provides electricity to Coloradans, but Brulle still counted every penny of its 9-figure annual income as though it were a K Street public policy powerhouse. Indeed, IREA single-handedly accounts for over 21 percent of all the money behind Brulle’s alleged Conspiracy. Counting spending, not income. By counting income rather than spending, Brulle overstated the activities of The Conspirators in 2010 by $169 million, or about 13 percent (the groups’ revenues were $1.51 billion, versus $1.34 billion spending). Isolating Global Warming expenditures. Brulle lumped all the groups’ activities together, even if the group was a think tank with a wide issue portfolio or a rural electricity co-op with a miniscule advocacy budget. When CRC investigated the actual proportion of their spending focused on climate science—by speaking to the organizations, examining their IRS filings (which sometimes specify expenses by category), tallying media mentions and web pages, reading the groups’ annual reports, etc.—it found that at most 5 to 6 percent of the Conspirators’ spending attempted to engage the public on the science of climate change. That knocks another $1.24 billion off the Brulle Number for 2010. So, after correcting for Brulle’s poor methodology, the inflated Brulle Number of $1.51 billion (for 2010) plummets to $0.1 billion—an overstatement of 93 percent. Brulle mildly referenced his inadequate methodology 2, but he likely knew reporters would distort his bloated figure and attribute every penny to climate change “denial,” as the Guardian and many others did. Of course, CRC’s calculation of 5 to 6 percent spending on climate science is only an imperfect estimate. But we’ve posted all our data online, and unlike Brulle, we welcome debate. 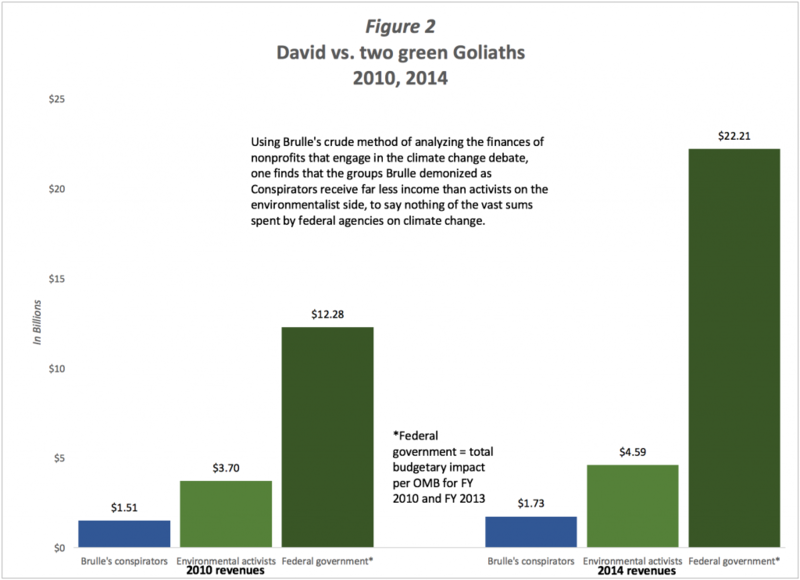 Brulle’s anger over the Nisbet study is understandable, because it found that Global Warming alarmists are the real Goliath in this debate, while the smaller David is played by the less wealthy and powerful skeptics. Nisbet’s study of 2009 data concluded—using crude, Brulle-style methodology—that environmentalist groups with alarmist views on climate change enjoyed $1.7 billion in revenues, versus $907 million for think tanks, advocacy groups, and industry associations on the other side. We found something similar when we investigated data for 2010 (the last year Brulle studied) and 2014 (the most recent year available). Using Brulle and Nisbet’s methodology, we totaled income for Brulle’s 91 Conspirators on the center-right, and then we compared that figure to the total income of environmentalist groups. In 2010, alarmist groups’ income was $3.7 billion vs. $1.5 billion for skeptical groups. And yet another large issue complicates Brulle’s claims: he says the defining characteristic of the Conspirators is an effort to block “legislative restrictions on carbon emissions.” Yet it’s easy to show that many of the groups Brulle identifies as conspiring against this goal have in fact supported carbon taxes, which means they don’t belong on his list in the first place. Scholars at the American Enterprise Institute, for example, both during the period he studied and more recently, have advocated in their own studies and at conferences, not to mention in the mainstream media, in favor of a carbon tax.4 Under Brulle’s parameters, AEI should have been removed from the analysis, and its millions in income cut from the Brulle Number altogether. One last inconvenient truth lies at the center of this dispute over funding: all the nonprofit funding on both sides can’t compare to what the federal government spends on climate change programs and messages. The federal Leviathan is so hydra-headed that no one knows for certain how much it’s spending in this area, but the best estimate, based on numbers directly from the federal government, is that from Fiscal Years 1993 to 2014, total U.S. expenditures on climate change exceeded $166 billion in 2012 dollars. In sum, Brulle’s study and its distorted reverberations in the media echo chamber grossly misled the public about groups active on both sides of the climate debate. If environmentalists seek an excuse for their failure to see their preferred policies enacted, they’ll have to find a better one than the funds going to their opponents. Disclosure: Brulle lists the Capital Research Center as a Conspirator, and we have indeed received support over the years from his two bêtes noires, Exxon and Koch-related philanthropies. But Exxon stopped giving to us a decade ago, and funders focused on climate change issues have never provided as much as 10 percent of our annual revenues. Nor have we ever devoted as much as 10 percent of our spending to climate science. To provide additional context on the debate over climate change, we have assembled a collection of scientific predictions of climate disasters—both hot and cold—from the last 122 years. And we also have an essay from Kenneth Haapala, “A Short History of Global Warming Fears,” that explains how present worries over warming stem from an educated guess in the 1970s, leading to projections of climate change that have failed to be borne out by the evidence. E.g., Kenneth P. Green, Steven F. Hayward, and Kevin A. Hassett, “Climate Change: Caps vs. Taxes,” AEI Environmental Policy Outlook, June 2007; https://www.aei.org/wp-content/uploads/2011/10/20070601_EPOg.pdf. Nick Schulz, “The Merit of a Carbon Tax,” The Hill, July 31, 2007; https://www.aei.org/publication/the-merit-of-a-carbon-tax/print/. Marlo Lewis, “AEI Hosts Fifth Secret Meeting to Promote Carbon Tax,” July 11, 2012; http://www.globalwarming.org/2012/07/11/aei-hosts-fifth-secret-meeting-to-promote-carbon-tax/.